Shameless and Hungry: "Legends Never Retire"
With his retirement, it almost feels as if our favorite childhood memories are being yanked away from us. The fact doesn't sink in yet, even though we witnessed the God of cricket getting emotional yesterday. As he has always been in his career that lasted almost a quarter of a century, Sachin Tendulkar was honest and moving even in his farewell address. Just two months past my birth, Sachin Tendulkar made his debut in international cricket. So in a way, I'm one of those blessed millions who grew up watching his cricket. I wasn't too conscious to notice the number of matches that took him to score his first century, but I do remember the times thereafter when they had become a habit. It is hard to comprehend without tears in my eyes that he won't be playing for India - for it's people, for us - no more. For me, it is like one of the few remaining connections to our childhood is being forcefully withdrawn. Withdrawn into the annals of the history books. Immortalized forever. When it comes to the best of his game, I can clearly remember the following innings in particular. This is a man who breaks and makes a new record every other day. Maybe everyone would quote his record-breaking matches, where he became the first to score 200 and 300 runs, but to me, these innings were way more special. 1. The Sydney Test against Australia, January 2004. Sachin was known to be a lot of things - cricketer, master blaster, sports legend, the little master, the God of cricket - but that day at Sydney, he had become someone else. A teacher. While on the crease, the whole 613 minutes that he had played, he was frequently taunted by each player in the opposition to try hitting a drive against the best known bowling attack in those days. The classical shot for which he was best known was however, a ruse. Not only was that region of the ground well covered by some of the best Australian fielders, he had also lost his wicket on several occasions to the same shot, earlier in the series. "Sachin was so focused. He never looked like getting out. He was batting with single-minded devotion. It was truly remarkable. It was a lesson." - Martina Navratilova, after watching him bat at Sydney. Sachin decided to block the impulse to play his most practiced and most favorite shot of all, while trying all other kinds. In the 613 minutes and all the 436 balls that he faced, not one shot was a cover drive as he went on to score an unbeaten 241 runs! He just left all the balls bowled to him on the off-side. He compelled the bowler to ball on to him and when they did, he made them pay. Rarely in the history of sports, and maybe never in the game of cricket, have we witnessed a player with such discipline. That moment on, he was my hero. My God. 2. Centurion, South Africa, in the World Cup of 2003. While the same ground was witness to the only match India had lost before the final, the India v Pakistan match was the most eagerly awaited spectacle in one of the most successful World Cup ever. There was no shortage of emotion or adrenaline-rush as the two countries, at the best of their forms, locked horns in the pool stage tie-up. At 273 for 7, Pakistan demanded India to challenge Saeed Anwar's efforts in the previous innings (101 in 174; point to be noted, he was bowled over by Ashish Nehra. Chullu-bhar paani anyone? ), while having to face the menacing bowling attack of Waqar Younis, Shoaib Akhtar and Wasim Akram in that match. Sachin was out of form and distressed by poor health prior to the match. Fighting leg cramps and back problems, Sachin blasted a 75-ball 98 runs! He steamrolled the fierce bowling attack with such panache, that the Rawalpindi Express was derailed, taking down all the other Pakistani pace maestros with him. Although he got Sachin's wicket at last, his ten-over spell of 1-72 in that match remains, till date, his worst. Sachin could not finish his century, but he provided the antidote that India needed to recover in that match. Rahul dravid and Yuvraj did the rest and India maintained their 100% win record against their bitter rivals in all the World Cup matches they've played, with 26 balls to spare. 3. Take any random match where Sachin-Sourav was the opening partnership. The left-hand, right-hand batting partnership was always a treat to watch. They have numerous records to their overall opening partnership - thrice have they completed the whole match without throwing their wickets! Such partnership was only rivalled by the Atapattu-Jayasuriya and Gilchrist-Hayden duo, but none came even closer to score as much as they have piled up together. 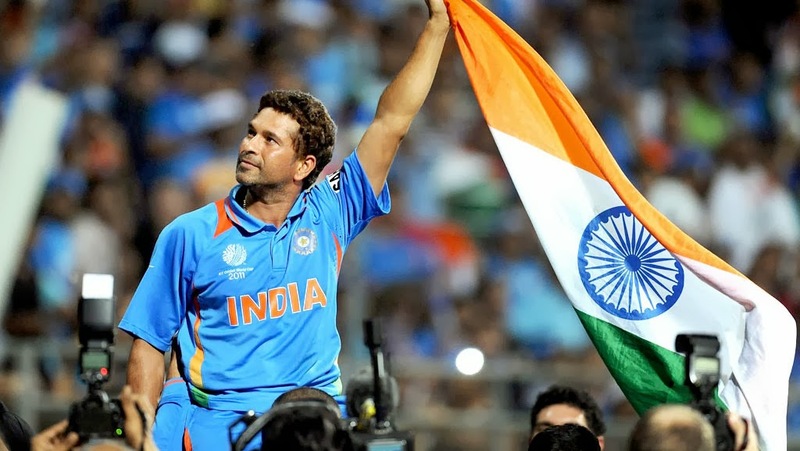 Whether Sachin Tendulkar deserved the highest civilian award of India is being debated now. And I totally stand by the decision. In his heydays, this man had made it a habit of uniting a nation similar in ways to the oneness that was brought on by the Civil Disobedience Movement about 50 years back. Sachin is, and has always been, a national symbol, his innings were the hopes of a hundred million people! His sure-footed strokes were bricks in the confidence that this nation built on itself. The Wall Street Journal rightly stated that this kind of mourning (upon his retirement) and unity was last seen only at the death of Mahatma Gandhi. Beyond sports, he is an exemplary national icon - we can quote him in classrooms, preaching lessons on discipline, determination, hard work, humility, and above all, how to be a good human being. He did it all and he did it with an intense sense of nationalism. That is what I expect of a 'Ratna' of this country. The reason I believe, Leander Paes doesn't yet deserve a Bharat Ratna, is because his rift with Bhupathi was publicized not just by the media but by both parties themselves. Now I do not want to see a 'Ratna' of my country tearing their teammates apart at press conferences. Do you? That's too cheap a thing to do. But that being said, I still am a huge fan and I think he deserves the highest sports award of this country. Major Dhyanchand deserved it too. But I can only quote his records to support my point of view. My father's place being Jhansi and his mama-bari being Allahabad, he and all my uncles have very closely followed Dhyanchand's life in first person. They speak of him and his life the way we talk of Sachin and Ganguly. Hence it makes more sense when he claims that Dhyanchand - his hero - should be rewarded Bharat Ratna first. Maybe he just missed on to it, being born ahead of his time. In my case I'm just happy as Sachin - my hero - did. What happens now? I don't know. But on a lighter note, this video up there explains it well. What I do know is this: the likes of Kapil Dev, Gavaskar and Amarnath were born to see off the West Indies and English might in cricket. Sourav, Dravid, Kumble and the Very Very Special Laxman were born to see off the great Australian power. 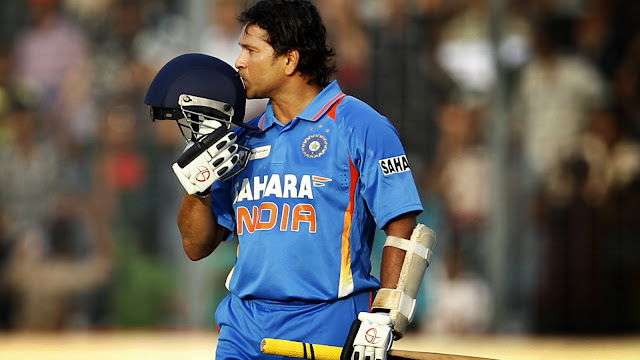 Sachin Tendulkar, in his 24 years of cricket, has seen, faced and destroyed the best bowling attacks in the world. Be it Pakistan, be it Australia, be it Zimbabwe or be it South Africa. It was his, and Ganguly-Dravid-Rahul-Laxman's destiny to pull India out from where they were underdogs and put them right up there as a formidable side to face. It had always been their destiny. The Indian team owes them. We're at the top of the game because young cricketers wanted to be like Sachin. Because young Kohli, young Rohit Sharma and young Shikhar Dhawan grew up watching their idol effortlessly destroy every challenger. That gave them confidence. Aggression was Ganguly's gift to the team, determination was Rahul's, confidence was Laxman's, humility was Kumble's... while all that together was the Little Master's child. Thank you Sachin. I thank you from the bottom of my heart. A thousand salutes to you. I love you. Thank you for all those wonderful childhood memories. I wish you never had to retire. How I wished you would go on and on. That you would prove yourself wrong about you not being a God. For you are one, to me and those hundred million people who chant "Sachiiin-Sachin" in even the matches you don't play. Nice piece... expected more of lash out at vipers who say. He doesn't deserve the title.. but you kept it apt and precise... The last bit where you mention the legends that made underdogs to the champs.. was the icing.. as the last of the legend.. retires..HE WAS THERE AS THE SAGA WAS FORMED AND TO END IT!! After hearing so much about him, this still comes as a pleasant and proud reading. Thanks deep. I didn't want to lash out at the people who criticized the Bharat Ratna decision. It was not how Sachin would've wanted it to be like. *(Sweet! What a dialogue! See? Does a happy booyah at his line..) Thanks you liked it man! Its a much muted response from me. Inside I'm publicly bawling! Soon we'll get to see "Like this, if you're still doing 'Sachinnn-Sachin!' at the grounds" on social networks! What a legacy. Nicely written. For someone like me who was born in early eighties, his debut coincided with the time we were just getting hooked up with the game and from then on he was always there... We always asked the India score first and then the next question would be how much Sachin scored. Not as good as you in translating thoughts into words but am feeling a hollow within especially after watching his speech. Until then it didn't sink that he is really going away.. Indeed Joydeep da, his was one of the finest speeches I've ever heard. Gives us that feeling we got while watching Bhaag Milkha Bhaag, except that it was fuelled by music, melodrama, lighting, acting and some heart wrenching effects. Sachin's speech had just words - heavy words - and they got the same effect on all of is.